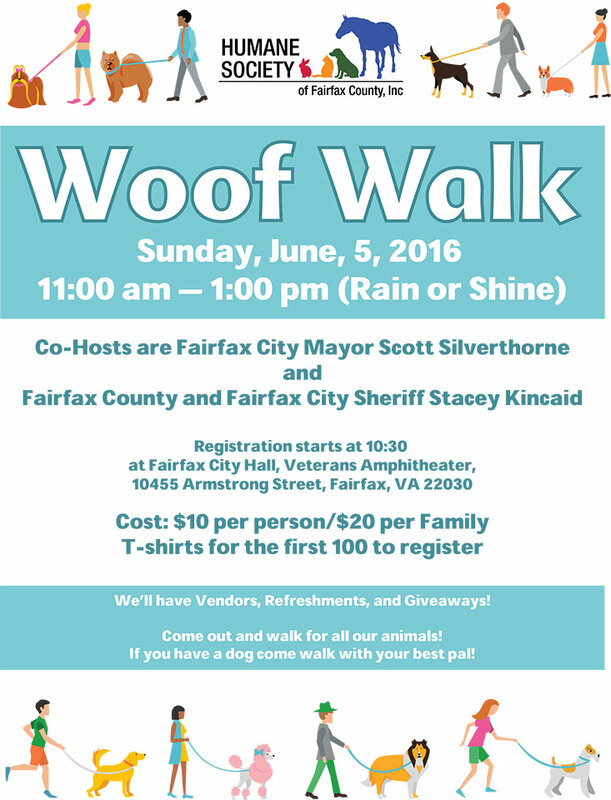 Join us Humane Society of Fairfax County for the 2016 Woof Walk! Co-hosts for the event are Fairfax City Mayor Scott Silverthorne and Fairfax County/Fairfax City Sheriff Stacey Kincaid. Registration starts at 10:30 AM at Fairfax City Hall, Veterans Amphitheater (10455 Armstrong Street, Fairfax, VA 22030). Cost is $10 per person, or $20 per family. T-shirts available for the first 100 to register! We’ll have vendors, refreshments and giveaways! Come out and walk for all our animals. If you have a dog, come walk with your best pal!